Looks like beer…. possibly tastes like beer… but is it beer? NO! One of the things that Westerners have to adjust to when moving to an Arab nation are the rules regarding alcohol. 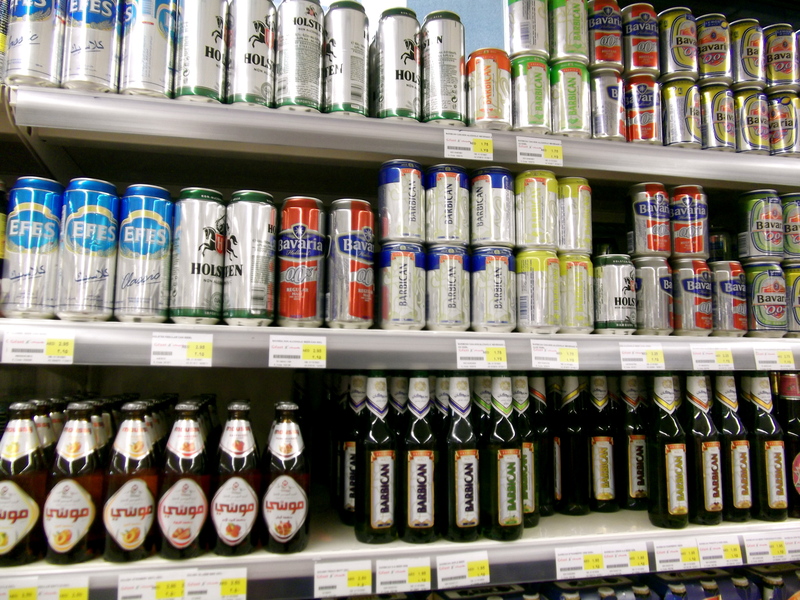 As Muslims are not supposed to drink alcohol, you cannot buy booze in the general supermarkets or convenience stores. However, they do have a massive fake beer section in almost every supermarket. Looks like beer… and in fact the bright blue can on the middle shelf is made by Efes, a Turkish brewery that makes delicious <and very real> beer. I haven’t tried one of these yet, but maybe I should? Who knows, maybe it tastes good.. and of course with no risk of hangover? So, where do people go to drink? Well, like I said, there are lots of normal bars all over the place which are absolutely jumping on a Thursday and Friday night. In fact, in a nice twist of irony, because booze is so expensive in bars due to import tax, most bars have Ladies Nights where you walk in the door and get three or four free drinks, I suppose under the general belief that guys go wherever girls are. Score for me! And you don’t need a liquor license for that either. One of these days I will have to try doing a whole week of free drinking, a different bar every day of the week.